• Worst Week in a Month. U.S. stocks fell in tandem with bonds on Friday, capping the S&P 500 with its worst week in a month, as a selloff in Treasuries sent yields to seven-year highs. Bond prices slid as fallout persisted over Federal Reserve Chairman Jerome Powell’s comments that solid economic growth will eventually prompt the central bank to raise rates to cool an overheated economy. Investor sentiment also weakened amid speculation the latest payrolls report opens the door for rising interest rates. • Weekly Performance. For the week, the S&P 500 fell 0.95%, the Dow Industrials slipped just 0.04% and the tech-heavy Nasdaq Composite sank 3.18%. • Mixed Jobs Data. September payrolls rose by 134,000, widely missing projections for 185,000 as Labor officials cited hiring disruptions caused by Hurricane Florence. Average annualized hourly wages ticked down to 2.8% from 2.9%. On the bright side, upward revisions for the prior two months added 87,000 jobs, helping lift the three-month average to 190,000. The unemployment rate fell to 3.7%, the lowest since 1969. • Consumer Discretionary Falls Most. Seven of the 11 major sector groups ended negative last week, led by Consumer Discretionary (-4.37%) and Real Estate (-2.71%). Communication Services and Technology both fell by 2.20%. Energy (+1.86%) and Utilities (+1.86%) gained the most, followed by Financials (+1.59%). • Selloff in Treasurys. Treasury securities extended declines on Friday, sending the yield on benchmark 10-year Treasury notes up 4.6 basis points to 3.234% and up 17.2 basis points on the week. The U.S. Dollar Index weakened a second day on Friday, slipping 0.13% to end the week at 95.624. WTI crude oil prices climbed 1.5% last week to $74.34/barrel, despite a 1.7-million-barrel weekly build in U.S. oil stockpiles. Friday, October 12: Import/Export Prices, University of Michigan’s Consumer Sentiment. High yield bonds are fixed-income obligations of lower credit quality, which therefore offer investors a premium for taking more credit risk. This premium, or "High Yield Spread", is expressed as the difference in yields (effective interest rates) between high yield and comparable safe bonds. The amount of spread demanded by investors as compensation for additional risk is an effective market-based metric of evaluating bond default risk and economic strength. 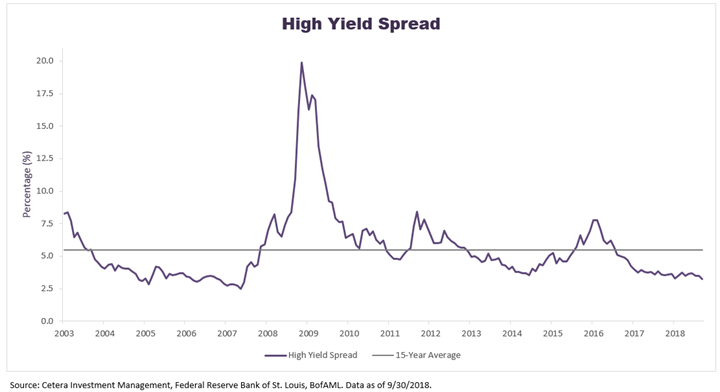 The average high yield spread historically has been just over 5%, but as can be seen from the chart above, investors will demand higher risk premiums in difficult economic times. This occurs as the risk of bond defaults, which lead to loss of principal, increases. In 2008, high yield spreads peaked at 21.8%, and they neared 9% during 2016's growth scare market. Over the last two years high yield spreads have narrowed, as economic growth has stabilized. This risk premium hit a post-recession low of 3.16% last Wednesday, before rebounding to 3.29% on Friday. The current level of bond defaults is low, so the spread is sufficient to cover near-term default risk. However, a high yield spread this low is typically only observed in late stages of an economic expansion. In our view, should economic growth slow, this spread may increase sharply from its current lows, which may push high yield bond prices lower. For this reason, we recommend a measure of caution when investing in high yield bonds.